Delivery times - Orders are despatched to you within 7 days unless there is a delay caused by the weather conditions. We shall inform you via email of the delivery day as soon as it is known closer to the time. You can add to your order at any time. If you wish to add to your order then please email us and we shall send you a ref code that can be used for free shipping. We shall let you know when your order is being shipped via email. If you change your email address at any time please change your details on your account. Give your plants the best possible start Rootgrow helps to ensure the establishment and lifetime health of your plants. 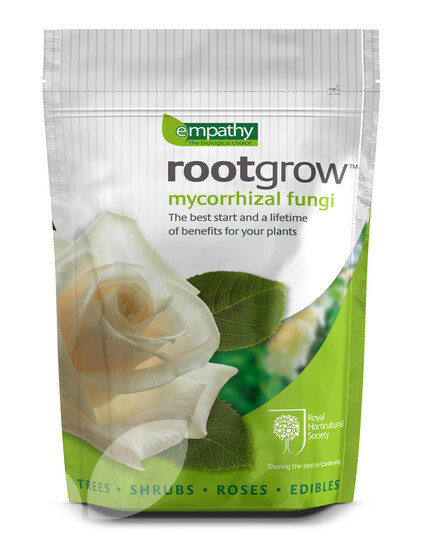 Mycorrhizal fungi are critically important to those plant groups to ensure good establishment and better early growth. In the case of fruit mycorrhizal fungi are particularly good at extracting Phosphorous from clay soils. 1 Pack Will Treat Up To 4 Bare Root Plants. Ordered some Rootgrow with two Hazel trees. I find mycorrhizal fungi helpful for getting trees and other plants going but one of the trees is struggling after a couple of months. So, hard to tell whether the Rootgrow has provided enough help. Used with my bare root apple tree and currant bushes to get them off to a quick start! I have used this with most of my bare root trees and have always had very successful results with very few failures over the years. My trees always seem to do much better than my neighbors, and I put it down to this product. Hopefully the plants will establish well with rootgrow. All 9 plants received last autumn and planted with root grow seem to be thriving. Excellent service from Blackmoor.